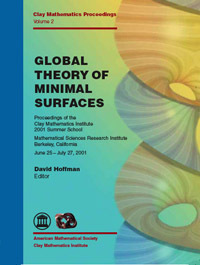 In the Summer of 2001, the Mathematical Sciences Research Institute (MSRI) hosted the Clay Mathematics Institute Summer School on the Global Theory of Minimal Surfaces. During that time, MSRI became the world center for the study of minimal surfaces: 150 mathematicians--undergraduates, post-doctoral students, young researchers, and world experts--participated in the most extensive meeting ever held on the subject in its 250-year history. The unusual nature of the meeting made it possible to put together this collection of expository lectures and specialized reports, giving a panoramic view of a vital subject presented by leading researchers in the field. The subjects covered include minimal and constant-mean-curvature submanifolds, geometric measure theory and the double-bubble conjecture, Lagrangian geometry, numerical simulation of geometric phenomena, applications of mean curvature to general relativity and Riemannian geometry, the isoperimetric problem, the geometry of fully nonlinear elliptic equations and applications to the topology of three-dimensional manifolds. The wide variety of topics covered make this volume suitable for graduate students and researchers interested in differential geometry.